Speaking to shareholders at the Zoetis Inc. (NYSE:ZTS) annual meeting today in Short Hills, N.J., Chief Executive Officer Juan Ram’on Alaix highlighted the company’s 2014 performance and strategies for future growth as the global market leader in animal health. 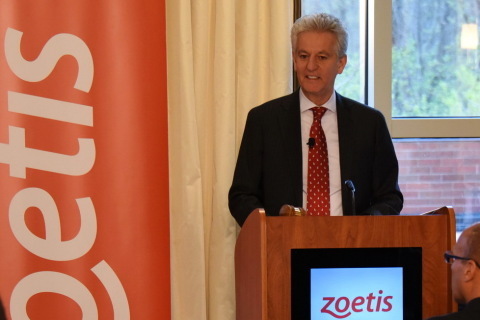 Zoetis CEO Juan Ramon Alaix speaking at the 2015 Annual Meeting of Shareholders. Sanjay Khosla, Dr. Willie M. Reed and William C. Steere, Jr. have been elected as directors for three-year terms. Shareholders voted to approve the compensation of the company’s named executive officers. Shareholders ratified and approved the selection of KPMG LLP as the company’s independent registered public accounting firm for the 2015 fiscal year. The final results of the shareholder voting are subject to verification by the independent election inspectors; results will be filed in a Form 8-K and available on the Investor section of the Zoetis website. A full replay of the meeting will be made available at http://investor.zoetis.com/events-presentations, along with the presentation materials from the event. Zoetis (z^o-EH-tis) is the leading animal health company, dedicated to supporting its customers and their businesses. Building on more than 60 years of experience in animal health, Zoetis discovers, develops, manufactures and markets veterinary vaccines and medicines, complemented by diagnostic products and genetic tests and supported by a range of services. In 2014, the company generated annual revenue of $4.8 billion. With approximately 10,000 employees worldwide at the beginning of 2015, Zoetis has a local presence in approximately 70 countries, including 27 manufacturing facilities in 10 countries. Its products serve veterinarians, livestock producers and people who raise and care for farm and companion animals in 120 countries. For more information, visit www.zoetis.com. Forward-Looking Statements: This press release contains forward-looking statements, which reflect the current views of Zoetis with respect to business plans or prospects, future operating or financial performance, expectations regarding products, future use of cash and dividend payments, and other future events. These statements are not guarantees of future performance or actions. Forward-looking statements are subject to risks and uncertainties. If one or more of these risks or uncertainties materialize, or if management’s underlying assumptions prove to be incorrect, actual results may differ materially from those contemplated by a forward-looking statement. Forward-looking statements speak only as of the date on which they are made. Zoetis expressly disclaims any obligation to update or revise any forward-looking statement, whether as a result of new information, future events or otherwise. A further list and description of risks, uncertainties and other matters can be found in our Annual Report on Form 10-K for the fiscal year ended December 31, 2014, including in the sections thereof captioned “Forward-Looking Information and Factors That May Affect Future Results” and “Item 1A. Risk Factors,” in our Quarterly Reports on Form 10-Q and in our Current Reports on Form 8-K. These filings and subsequent filings are available online at www.sec.gov, www.zoetis.com, or on request from Zoetis.